This lovely apartment is located in the north end of Sayulita, the most exclusive and quiet neighborhood of this beautiful vacation paradise. Condo 209 located on the second floor, 2045 sqft. just 2 min. from the beach. Fully equipped with air conditioning, gourmet kitchen, two bedrooms both with retractable mosquito netting. Each with two complete bathrooms, and jacuzzi in main bedroom, laundry room, computer with wireless internet access, 37' flat screen TV with full cable service SKY and dvd, pool, roof garden, and concierge. We offer daily room service if desired. IMPORTANT: Pajaro de Fuego is built on a hillside and has ramps and stairways with wide railing. Children under the age of 5 need constant supervision, and the facility may not be suitable for people with handicaps. Exquisitely decorated in west coast Pacific style, it has been fully equipped to ensure that guests feel at home during their stay. The two bedrooms have air conditioning and high quality bedding and towels; the main bedroom has a king size bed with linen mosquito netting and a Tanoshii futon that can be used as a very comfortable double bed or a sofa. All of the windows have retractable mosquito netting. The bathroom comes equipped with a jacuzzi, a large closet, iron and ironing board, and hairdryer. Security box in walking closet. The south balcony is just outside the main bedroom and here you can enjoy an spectacular ocean view. The other bedroom has 2 twin beds with linen bedspreads, and a spacious bathroom with convenient access to the living area. The window fronts onto the jungle with a partial view of the ocean. Here you'll find a personal computer with internet access. There is wireless internet access throughout the entire complex. 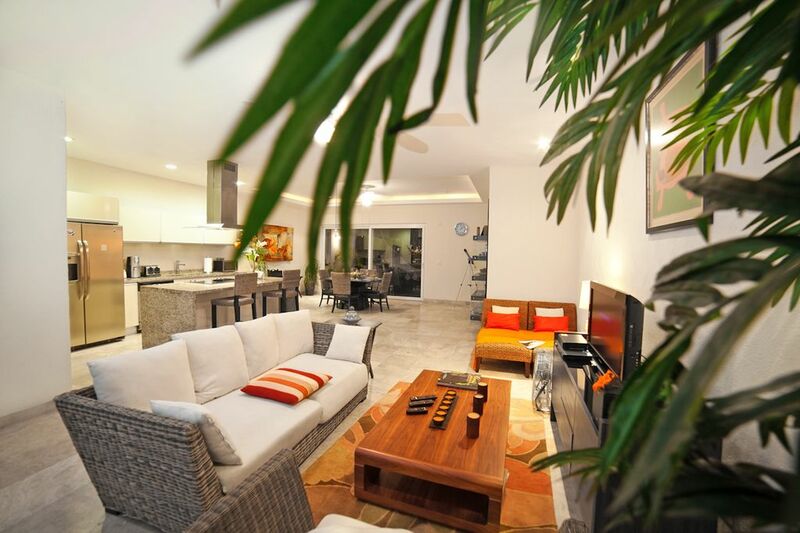 The spacious living/dining area is tastefully decorated and includes a sophisticated entertainment center. Ceiling fans and an ocean breeze from open windows protected by retractable screens keep the air circulating in the room. There is a 37' flat screen TV with full cable SKY, dvd player, and home theatre. There is also a collection of popular dvds, books in English and Spanish, and board games to enjoy with family and friends. The north balcony, off the dining area, has a tiled deck with a different view of the sea, the jungle, and the gorgeous swimming pool of Pajaro de Fuego. From the hammock or the four-person table, you can see everything and still maintain your personal privacy. The Italian gourmet kitchen has granite countertops, a stove with oven, double refrigerator, and all of the modern kitchen appliances to prepare everything from a sandwich to pastries,to Mexican and international cuisine. There are three sets of dishes for six people. Next to the kitchen is the laundry room stocked with beach accessories: 1 beach umbrella, 4 beach chairs, 2 air mattresses and beach towels. Unit 209 also provides you with the convenience of a sewing box and medicine cabinet stocked with basic non-prescription medication should you happen to need it. Daily cleaning service is provided if desired. Common Areas: Infinity pool with ocean view, Outdoor jacuzzi, Roof Garden, 24 hr security, Lobby with TV and wireless internet access, Enclosed parking. Great accommodation in a beautiful complex. Great condo in a beautiful complex. Very helpful staff. We enjoyed the deck off the kitchen and the one off the back master bedroom. The pool was pretty and peaceful. It was nice to have a completely stocked kitchen. We utilized the beach chairs & beach towels provided. I think renting the golf cart was a good idea for us at least, as we wouldn’t have wanted to walk uphill home every time we went to town. Plus golf carts have a nice secure garage to park in and plugs to recharge. AC kept humidity down, not needed at night but great mid afternoon. I’d definitely recommend this condo. This was an amazing condo. The owner was very responsive with any questions I had and made me feel like a part of the family! The condo is well stocked and very clean. I enjoyed the modern feel of the condo- I look forward to booking again in the future!! Thanks for your comments Brian. We want to see you soon in our home. We enjoyed the condo complex and the condo itself was sufficient but in general, the whole apartment needs upkeep. There were other apartments in the Pájaro del Fuego complex available for a lower price, and we chose this one because it looked the nicest. But there were cracked counters, water stains, damaged furniture, and stained upholstery that was covered with towels. The pictures on VRBO definitely are not recent. Also, when we encountered a problem with the washing machine and left a message with the property manager, she never responded. Somewhat frustrating. We wouldn’t return to this particular condo. We appreciate your feedback and are very sorry that you weren’t fully satisfied with your stay. Unfortunately, the unit above us had a plumbing leak just before your visit, and we had some water damage in the apartment. We worked as fast as we could and made sure that the unit was comfortable for your stay, but we understand that some things were not aesthetically perfect. We apologize for that. We have worked hard on these issues to keep Las Verandas as a five star property, and everything has now been repaired. We do believe that we have one of the nicest units in Pájaro de Fuego. As for the washing machine issue, our property manager says she had a missed call, but did not realize that it was from you. We apologize for that. When you text messaged her a few days later about the washing machine, she immediately checked with the maid and it seemed that it was working fine. We haven’t found any problem with it, but are sorry that it wasn’t working correctly for you. El departamento se encuentra bien ubicado. Sin embargo es un departamento al cuál no se le ha dado mantenimiento desde que fue construido (alrededor de 7 años) el mobiliario y la decoración no ha sido renovado y se encuentra en mal estado, hay humedades en los baños, la placa de mármol donde se monta el ovalin del baño principal se encuentra rota, los canceles de los baños desajustados y con riesgo de desprenderse de las paredes, el mosquitero de la puerta del salón principal inservible, mecanismo de las cortinas de la segunda habitacion sin funcionar, tapete sucio de salon principal, ropa de cama, toallas de baño y de playa viejas, rotas y en mal estado. Comunicamos a la propietaria todos estos problemas y muy amablemente trato de solucionar lo mejor posible (compro sabanas y toallas de baño nuevas), sin embargo cuando pagas una tarifa de más de 200 dólares americanos por noche uno espera llegar a un departamento en buenas condiciones o al menos que te compensen con un precio mas razonable. El mantenimiento exterior del departamento esta en pésimas condiciones sin pintura, el barandal arruinado, el deck desajustado. Además tristemente descubrimos que la bahía de Sayulita se encuentra contaminada de aguas negras. Justo en medio de la bahía en el punto donde nadan los surfistas desemboca un río de aguas negras con muy mal olor y la arena es sucia por lo que todos los días preferimos transportamos a otra bahía cercana en el pueblito de San Pancho. We are very sorry that our guest was not satisfied with their stay at Las Verandas, but we believe very strongly that this review is unfair to our condo. Anyone who owns property near the beach knows that it requires constant maintenance. To say that we haven’t done any maintenance in 7 years is ridiculous. As we just finished the high season, the complex is currently updating and painting all exterior areas. A few days before your arrival, the unit above us had a leak which did a little superficial damage. We had to wait until after your departure to paint it, as we didn’t want our guests having to smell paint fumes. But we didn’t believe it would affect your stay at all. The mosquito screens actually did work, but were a little difficult and needed adjusting. They work perfectly now. We checked the shower door, and it is not in danger of falling down. The guests just before you weren’t bothered by any of these issues, and gave us a 5 star review. Jean: From the day you arrived, you let me know that you weren’t happy with some details of our condo, and we believed we resolved all of the issues very quickly. I was able to come for a visit, and you explained all the problems with our condo which you believed we should change. We had a nice time with you, Patricia and her son, and when we left, it seemed that you were satisfied with everything we had done and the state of our unit at that time. If you were really so unsatisfied, you should have requested a refund and gone to look for another property to rent in San Pancho. The location was awesome. You do have a steep walk up to the condo , which we loved. It’s close to the beach and an easy walk to town. Stacey was responsive when we needed something and awesome about her knowledge of places to eat, beach protocol, etc. Eric was great too when there was a small mishap and even offered remedies for an upset stomach! The condo could use a few more glasses. We ran short and there were just two of us. No soap in the showers. Everything else was perfect. We put the cleaning needed “flag” on the door handle but she didn’t make it. I think we were too late in getting it out on that particular day. We would definitely stay there again! Thanks for your comments, Liz. We hope to have you again as a guest. Sayulita has something for everyone - we guarantee that you will enjoy yourselves while you are vacationing here. SURF: Surfing is what distinguishes this beach from others on the Riviera Nayarit. Known as a beginner's surfing beach, the consistent and moderate waves make this a sought-after destination for surfers from as far away as Australia and Hawaii. There are several surfing schools and many qualified instructors to teach you this fun sport. BEACHES: The main beach is 1.5 miles long with an abundance of palm trees, large rocks, and hilly jungle at its perimeter. There are restaurants at the south end of the beach, as well as 'pangas' small boats that will take you out fishing or sailing to explore the Marietta Islands in Banderas Bay. Some of the beach restaurants will even cook your fresh catch for you! There is a lovely, smaller beach at the extreme southern end behind Punta Sayulita, called Playa de los Muertos (Dead Man's beach). It is accessible by foot or vehicle, and is so named because the path to the beach winds through the cemetery. The beaches and water are clean in Sayulita, thanks to a new water treatment system. GOLF: Within 20 minutes of Sayulita you'll find a variety of world class golf courses such as the Four Seasons Golf Club en Punta Mita, designed by Jack Nicklaus, El Tigre Golf Club in Paradise Village, Flamingos Golf Club, and Mayan Palace Golf Club. The closest and newest clubs are Litibu Golf Course designed by Greg Norman and the Golf Club in the neighbouring town of San Pancho, just a few minutes north of Sayulita. WHALE WATCHING: From November to March you can see whales on their annual migration north. The whales are visible in their natural habitat from certain vantage points on the beach, or you can hire a tour boat to take you out to sea for a closer look. THE OCEAN: From sailing on luxurious yachts to fishing excursions in sailboats, to snorkeling, scuba diving, and bird watching on the Marieta islands, there are many entertaining options to choose from on the Mexican Pacific coast. GYMNASTICS, YOGA, SPAS, SALSA CLASSES: Sayulita offers a variety of first class exercise options available at different times throughout the day. WALKING, MOUNTAIN BIKING OR HORSEBACK RIDING: Tours available for groups or singles with specialized local guides familiar with the area. Let them guide you on the safest and most interesting tours through the jungle and along the coast. RESTAURANTS. The quality and variety will surprise you; we recommend Don Pedro's on the beach, with beautiful ocean view, Calypso, Chocobanana, Cafe Sayulita, Ruben's, Captain Cook, Los Afortunados, Miro Vino, La Bodeguita del Medio, Fish Taco, Carmelita's, Medusa, y Terrazota at the north end of the beach. In addition, you'll find small street stands throughout the town that serve up tradicional Mexican food such as tacos, quesadillas and huaraches. From November to May, there is an organic street market with a variety of foods prepared by locals. HANDICRAFTS, BOUTIQUES, JEWELLERY STORES, GALLERIES, SURF SHOPS. Sayulita has a great variety of shopping options with reasonable prices. The local Mexican street market is in the centre of town on Sunday mornings, just down from the plaza. GROCERY SHOPPING. You'll find everything you need in the town to prepare your own meals in your private kitchen condo. There is a supermarket, Mega, in Bucerias, but once you get here, you won't want to leave. In Sayulita there are smaller shops like those of years ago, but they're modern and contain a little of everything. As the centre of town draws you in, buying groceries turns into a fun activity. Look for the green cart in the apartment to take with you to the grocery store, rather than using plastic bags. The fish market at the south end of the bridge is a must. Ask for the catch of the day which you will find displayed on ice, delivered fresh that morning. You'll find dorado, the most abundant fish in the bay, as well as corvillo, red snapper, sawfish, and shrimp, etc. You won't find fresher fish at a better price, you'll notice the difference! There is also a gourmet food and wine store, El Pico de Gallo, on calle Revolucion at the entrance to town, that has a wide selection of imported gourmet food items such as oils, vinegars, pastas, etc. There is an Oxxo in the centre of town. PHARMACIES There are several well-stocked pharmacies throughout the town; if they don't have what you need, they can order it. There are two medical clinics in town, Dr. Moy's a half block south of the plaza, and Sayulita Medical Services across from the bookstore on calle Miramar on the north side. RENTAL VEHICLES. A vehicle isn't required, as Pajaro de Fuego is only a ten minute walk from the centre of town, however, there are cars, golf carts and quads available to rent. IMPORTANT: Many of the businesses don't accept credit cards, and there are no banks in town. There are several outdoor ATM machines around Sayulita, one in Oxxo, and one in Alas Blancas by the beach, however for maximum security, it's preferable to use the ATM machines attached to the banks in Bucerias.